Building a pool for the first time can be a daunting & confusing prospect. There is a lot to learn and understand, especially when you get different advice. Hopefully the following will be beneficial. Are there any easements, underground pipes or services in or close to the proposed location of your pool as these can impact on location, size and add substantially to the cost. What do you want the pool to do. Whilst most people want a pool for recreation, relaxation and entertaining, some want a pool for serious exercise. What size / shape pool can you site cater for. Is the planned location shaded or in full sun (Shaded pools can feel cold). Where should steps be placed, do you want them to double as a seat or do you want a ledge / seat somewhere else in the pool. If you know someone who has pool ask them about their pool. This is a valuable resource when deciding on location , design , functionality and systems. Whilst some clients know exactly what they want and are prepared to pay the cost to achieve this, most will start the process with a budget in mind. Whilst this can be a good starting point, most people find the more they learn and like the higher the cost, but the better the result. If you know someone who has recently had a pool installed ask them about their experience. A good referral from family or friends is a good starting point. 90% of our work comes from referral. Another good place to start is by visiting the Spasa website, all builders listed are licensed with the VBA and must meet strict criteria to be members. You can also find builders at the Spasa Pool & Spa shows, which are run twice a year or via magazines. Whilst some people get 5-10 quotes a good number is 3 as more can lead to confusion. This part of the process can be the most difficult and confusing as in most cases builders will present different ideas and use different equipment which can make comparison difficult. Once you are clear on what you want don’t be afraid to ask your selected builders to re-quote your job, their response can help in choosing your builder. The goal should be to have at least two quotes for the same job. Importantly, don’t be rushed into making a decision. Give yourself time to fully understand each proposal and the total costs. Whilst some quotes might seem cheaper there is usually a reason and “add-ons“ can be expensive. 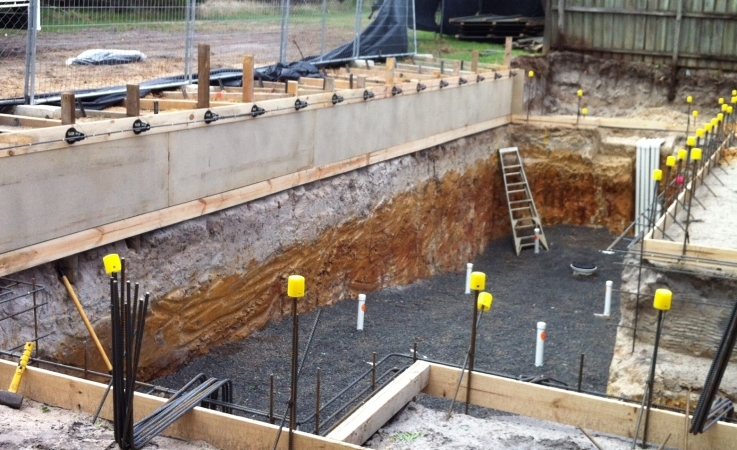 Finally, building a pool and the associated works is a considerable financial investment. Add to this the fact that your property will be a construction site for 4-6 months and their is a lot to consider. Most of our clients make their decision on who they most feel confident and secure with. A good open relationship with your builder is crucial for this will not only give you security but will also assist in delivering a result this meets all your hopes and expectations. Experience tells us that most jobs take 4-6 months to complete. Whilst the concrete shell will usually be installed within 7 -10 days, completion of all works such a plumbing, tiling, paving, fencing etc takes time, especially if delays are experienced due to bad weather or supply problems for materials such as paving stone. If your goal is to have all works completed in time for the warmer months, October – November, then start before May, preferably around March. Not only is the ground drier and firmer for excavation but you are giving the project time to be completed before the swimming season starts. Tip – In Melbourne, once the footy draws to a close and the weather gets better all sectors of the “backyard industry“ gets busy. Start early, give it 6 months and the transformation of your backyard will be an exciting, enjoyable and stress free experience.